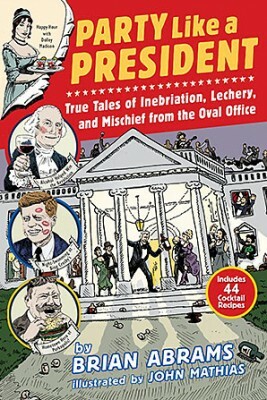 As hilarious and informative as it is cool to look at, Party Like a President, the new book by Brian Abrams with illustrations by John Mathias, is a handy guide to knowing the favorite vices of the men that have led our country since its founding. From George Washington learning to appreciate wine to Barack Obama’s prep school Choom Gang, Abrams gives a detailed history of all the ways each commander-in-chief liked to get loose. And while most of us might skip to see what JFK or Ronald Reagan drank or took while in the White House, it’s our 26th president, Theodore Roosevelt, whose entry might be the most unique. Known just as much for his service in the Spanish–American War or his love for the outdoors as he was anything he did in office, the seemingly always on T.R. really didn’t need booze or drugs to get him going. As we find out in this excerpt from Party Like a President, Roosevelt got high on something else entirely. In 2006, psychiatrists at Duke University Medical Center concluded that several presidents struggled with symptoms related to bipolar disorder. Chief among these illustrious head cases was Theodore Roosevelt, an alpha male whose contemporaries attributed his eccentric behavior to drunkenness, which was simply not true. The twenty-sixth president barely touched the stuff. At White House dinners, guests were bathed in fine wines such as a Marcobrunner or a Château d’Arsac Grand vin Le Montiel 1893, a great year, but Roosevelt refrained. Save the rare occasion for a mint julep or glass of white wine diluted with sparkling water, he mostly harbored a thirst for the blood of large animals. Indeed, the teetotaling psycho showed exemplary restraint while slaughtering hundreds of endangered species for sport. In no way did this trouble the local authorities. In fact, they recommended a special hunting permit for killing an unlimited amount of exotic animals that, if given the choice, would have much preferred a zoo cage. Roosevelt declined the generous offer and instead went with the standard license, the Noah’s Ark Massacre Special, which allowed the kill of two of each kind. He would surpass that number by quite a bit.